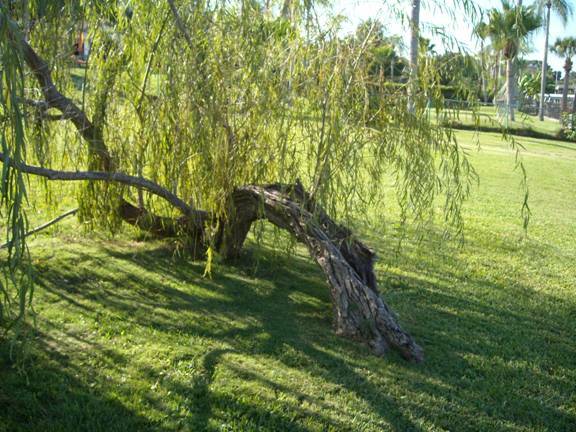 There is a story by Neil Gaiman in which he quotes a rhyme that suggest that late at night willow trees walk about. This one seems to be willing to have a go at it. I recently mentioned the harmless speculation that creatures on Mars by reason of their distance from the sun might combine mobility and photosynthesis if they exist, which I doubt. But one need not look so far. There is an article (PJM Desiccated Dispersal SCIENCE vol. 342 no. 6154 October 4, 2013 page 17 reviewing Proc. R. Soc. B 280, 10.1098/rspb.2013.1465 (2913)) that says at least some spores have leg like extensions that change shape with changes in humidity so that to a degree they are able to walk as the humidity fluctuates. Very strange.